“Word! Halleluiah! Amen!” That was my reaction when I heard Jeff Bezos dropped an important truth bomb we all needed to hear—“work-life balance” IS indeed a debilitating phrase. Not necessarily because there is a strict trade-off as Bezos implied, but because balance does not exist! This is an argument I’ve been making for more than 15 years. There is no such thing as balance. For most, balance infers the goal is a 50-50 split between work and the rest of our lives which rarely, if ever, happens. As a result, balance becomes the Holy Grail we never get and leaves us always thinking we need more balance. No, we don’t. We need to fit work and life together in a way that allows us to be our best on and off the job. Bezos is right. “If I am happy at home, I come into the office with tremendous energy and if I am happy at work, I come home with tremendous energy.” But where Bezos and I differ is on how to achieve this state of professional and personal well-being. For Bezos, the answer is a “mesh” between work and life or work-life “harmony.” Work and life are completely integrated into one whole. Work and life are one and the same. But for many, this “integration” is the problem. While Bezos may call his fit a complete “mesh,” even he describes how he sets boundaries and limits his accessibility by “eating with his family, takes a limited number of meetings and sets aside time for tasks such as washing his own dishes.” That’s something we all need to do. We need to encourage employees and colleagues to take control and find their work+life fit (my preferred term) based upon their ever-changing unique realities. 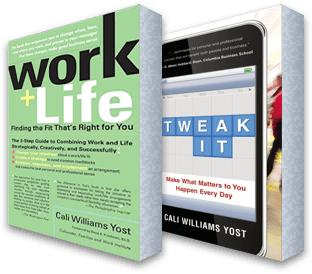 Explore the myriad of possibilities for the way work and life can fit together in today’s increasingly flexible workplaces. Recognize each of us has a completely different set of work and life realities at any given time. No two people are the same. Reaffirm there is no “right” way to manage work and life; therefore, a one size fits all policy won’t work and we can’t compare ourselves to others. Whatever term we use, remember it’s a verb, not a noun. We have to actively manage how work and life fit together and understand that fit is always changing. Sometimes there’s more work and less life. Sometimes vis versa. Props, high fives and kudos to Bezos for reinforcing an important truth—there is no such thing as work-life balance—and for being a voice and a champion on this issue rather than leaving it to Human Resources to manage, as so many do. If more CEOs and business leaders want employees that “come into the office and give everyone a kick in their step,” then we need to make it a strategic priority to help colleagues find and leverage the flexibility inherent in today’s workplaces.